People cannot live on bread alone- we need water too! Water is a vital nutrient during the summer because it acts as the body’s coolant. It should be a top priority because it is needed for temperature control, digestion, bringing energy into the cells and waste products out. Did you know that 40-60% of the body’s total weight is water? Believe it or not, dehydration begins when fluid loss exceeds only 1% of your body weight. This is when you start to feel thirsty. Your body’s ability to be physically active becomes impaired when you’ve lost as little as 2-3% of your body weight. 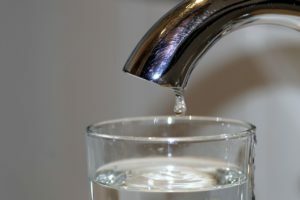 Dehydration becomes more rapid in hot weather, during long bouts of activity, and when you are sick. This is why it is important to drink water throughout the day to prevent yourself from getting thirsty. How can you stay hydrated? Cool, plain water is the best choice because it is absorbed fast and quickly fulfills the body’s needs. 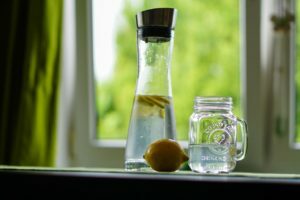 For those who like flavor and bubbles, club soda and seltzer water are absorbed rapidly like water, because they have no calories or carbohydrates. Choose cool, plain water to stay hydrated. Strive to drink at least half your body weight in ounces each day. Try adding sliced cucumbers or wedges of lemon or lime to iced water for added flavor. Avoid caffeinated beverages such as coffee, tea and soda because they force water out of the body. Keep in mind that alcoholic beverages also dehydrate the body. 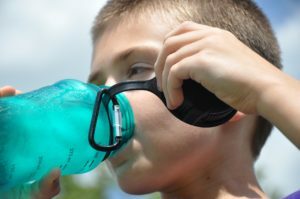 Be a real sport this summer, don’t wait until you are thirsty and stay hydrated with water! Anne-Marie has over 25 years of experience in the field of nutrition.She has shared her passion for food and health while working in a wide variety of settings including schools, grocery stores, fitness centers and hospitals.Her interest in nutrition started when she ran track in high school and wanted to learn how to improve her performance.Anne-Marie has run 20 (26.2)marathons including the first Women’s Olympic Marathon Trials and has competed in 14 triathalons. Her favorite foods are peanut butter, raspberries and yogurt.